This Polishing Cloth is a product of sleepless nights of knitting.... well.....Just Kidding! You can get some pretty badly tarnished pieces to come right back to life with a little rubbing, and this is one of the great joys of sterling silver. TIP: For flat designs, lay the cloth on a table edge and hold cloth tight with thumb and index fingers on one hand, and move the piece across the tentioned cloth with the other hand. But on the other hand, do what feels right! 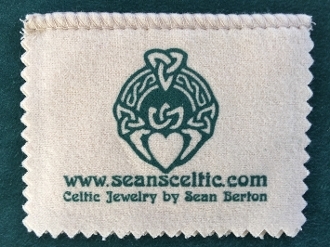 Yes, sterling will naturally tone in with oxidation, but getting back to a high shine is not that big of a problem IF you are equipped with a Hand Sewn One of a kind Sean's Celtic Creations Sterling Polishing Cloth! Well... OK.... these are a manufactured item that I have silk screened with my endorsement, since I believe you will be very happy to get all that formerly gorgeous jewelry, now tarnished and sad, out of the jewelry box, and back on your body where it belongs! Shine on Brothers and Sisters! Note that there are types of tarnish that are more difficult to remove, like that which is caused by perspiration and higher acidity in some folks. That more intense "chemically induced" oxidation is harder to polish off with a mere cloth than the "atmopheric tarnish" normally associated with sterling silver jewelry. There exists a very fine form of steel wool, graded as "000" grit, hiding on a shelf in the paint department of your local or BigBox hardware store, which will effectively remove "edge, back & chain" tarnish very easily, following up with a polishing cloth can bring back the high shine. This is not the best method to use on the "face" of a design, but for those folks (ususally guys) that like a bit of satin finish, steel wool of this grit can be used on the entire piece. I hope to address this and other maintenance topics in the FAQ section of the home page, which is not yet developed at the time of this entry. RINGS ARE A SPECIAL CASE! All manner of odd debris can become lodged in the lower engraved portions of the pattern on rings in particular, and on pendants and earrings as well at times. Block the drain on your sink to avoid taking your sink apart, get a soft bristled toothbrush, and gently brush the offending debris (hard hand soap, playdough, bread dough, suntan lotion etc). If you need a little liquid soap, that's ok if needed. Ladies, if you must use hairspray, take your earrings out first please. Always take care when cleaning the earwires, and take time to inspect the attachment point on the wire to make sure the wire loop touches the other side. If not, use needlenose pliers to wiggle the wire over to touch.